Are you someone who struggles to stay on top of things? Is your schedule all over the place, and does it stress you out? I used to be like that. In fact, most of my life was spent in a state of confusion and frustration because I couldn’t plan to save my life. No planning system ever worked for me, and it left me in a heap of sticky notes and half-used journals. The thing that finally turned me around is the bullet journal system. 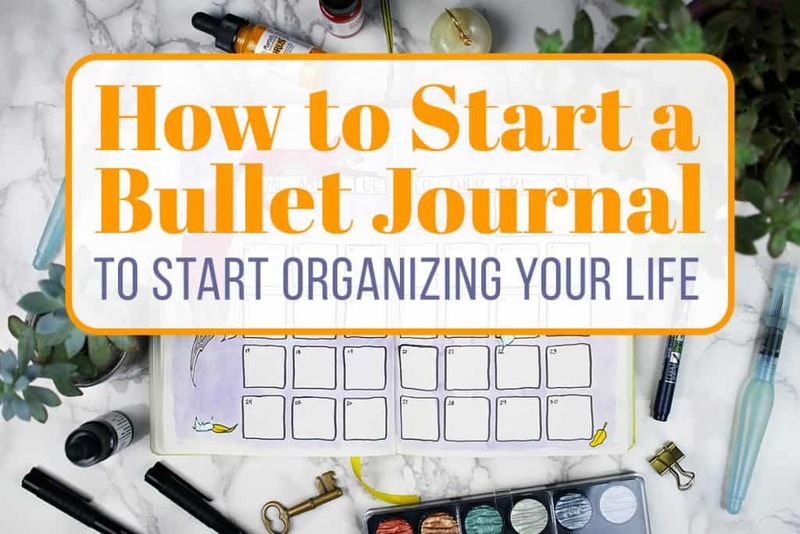 In this post, I’ll show you what the bullet journal is, how to start a bullet journal, and why it’s the solution you’ve need to get organized. Yes, this is real! Are you ready to have your socks knocked off? Okay, so first things first – what is a bullet journal? In a nutshell, it’s this awesome note taking/list making/groundbreaking technique that is completely customizable and flexible to your needs. Take a quick minute and watch this video to hear how to start a bullet journal straight from the mouth of the genius creator of the system, Ryder Carroll. You can also check out this huge ultimate guide about everything bullet journal! If you are anything like me, you have a bunch of ideas, doodles, notes, lists, and other nonsense tucked away in all kinds of places. You might use a notebook, your phone’s calendar, Post-It notes (paper ones and digital desktop ones), and task-oriented apps on your phone to try to keep all of these things sorted. Perhaps these systems work a bit, but they just don’t really do the whole job. You need something that can keep track of everything in the past, present, and future – not five systems to cover all your bases. My crutch? Journals. I love journals. I used to be guilty of buying all kinds of notebooks, journals, and sketchbooks to hoard on my shelves. I would do one of two things – use ten pages before I moved on to the next thing, or never write in them at all because I was terrified of ruining the beautiful blank pages. Even when I tried to use a blank journal for a planner or note stash, I just couldn’t make it work. It always felt like a temporary patch. When I discovered the bullet journal, my heart skipped a best. I knew that moment that the bullet journal was going to be exactly what I needed. But then I had to wonder – how to start a bullet journal and make it work for me? If you watched Carroll’s video, then you know the most wonderful truth – you don’t need much to get started. In fact, you only need a pen and a notebook. This notebook doesn’t have to be new, nice, or fancy in any way. Any old journal or notebook will do the trick. The bullet journal might even be the perfect way to use those half-used journals that I’m sure you have sitting around. 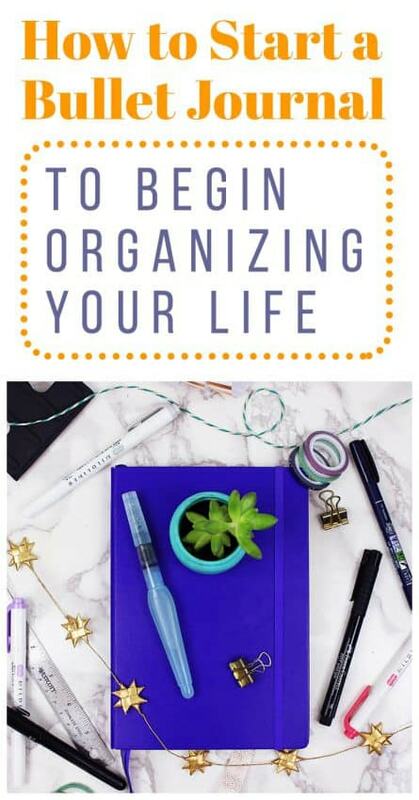 That can help take the pressure off you to make your bullet journal perfect so you can focus on making the system work for you. If you do want to buy a new journal to help you get in the mindset of planning, then there are a ton of journal brands that you can choose from. I personally prefer the ever popular Leuchtturm1917. You might also like to check out Moleskine or Rhodia journals – both of which I have tried and enjoyed. You can check out the My Supplies page to see a bigger list of supplies that I love if you want to look around! However, I just want to remind you that you don’t need to buy an expensive new journal. Literally, any notebook will do, but here are a few of my favorites! There are a million options when it comes to pens. Everyone has their own preferences when it comes to weight, ink, color, brand, etc. So in essence, this is totally up to you. I’m just going to suggest some of my favorite pens to get your creative juices flowing! To start your bullet journal, I would recommend that you keep things pretty simple. Find one good pen or set of pens that you can write with every single day comfortably. One great option for that is the Pilot G2 series of pens, which are extremely affordable and easy to find in stores. If you want something with a larger color range, perhaps you want to consider the Staedtler Triplus Fineliners or Paper Mate Felt Tip Pens. Both are easy to write with and come in a wide variety of fun colors. Another alternative is a fountain pen. I used to think fountain pens were for the ultra-fancy, but there are plenty of options that are cheap and extremely fun to write with. Seriously, you’ll be itching to write in your bullet journal every day with a fountain pen. If you’ve never used a fountain pen before, the Pilot Varsity set is just what you need. 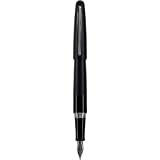 Or if you want something a bit fancier without a huge price tag, then you’ll love the Pilot Metropolitan fountain pen! There are a few things you need in your bullet journal to get started. Let’s cover some of your bases so you can get started in no time flat! The first thing you want to consider is a key for what symbols you want to use in your bullet journal. Carroll suggested some symbols that you might want to use, or you can create your own! Whatever the case may be, you want to make sure you remain consistent so you don’t confuse yourself with unclear notes. Another addition to your bullet journal is the monthly entry. Your monthlies serve as a wide-view lens as you plan your life. Some typical things that you can find in a monthly is some kind of calendar or list of dates, along with a place to write your monthly goals. This is one that I personally enjoy jazzing up with watercolors, hand lettering, and all kinds of artwork. You don’t need to go all out like this, but if it’s fun for you and helps you come back to using your bullet journal, then please be my guest! Something that you need to keep in your bullet journal is a place to write down all your daily to-do lists. This can take place in the form of a daily or a weekly. Basically, it’s the ground level of your bullet journal. All your regular day-to-day notes, scheduling, and task management happens here. There are a million ways to set up these entries, so it’s a matter of trial and error to find the one that fits you the best. I started out with dailies and worked my way up to weeklies when I realized that I preferred that layout. It’s totally up to you! Once you’ve set up your monthly and daily spreads, then it’s time to start exploring the wonderful world of collections! I can’t possibly get into it all here. There’s so many to talk about! Instead, I’d suggest you head over to my ultimate bullet journal guide, which has more detail on my favorite collections. This system was a lifesaver for me. It helped me develop from a stressed student into a full-time blogger and creative maven. If it weren’t for the amazing bullet journal system, I’m certain that I would still be a flailing, frustrated mess today. So if you’ve been searching for the right organization system for you, then look no further. You have found the perfectly flexible, adaptable, and fun system to take care of all your needs. Grab your journal and start your bullet journal today to start working toward your goals with productivity and purpose! If you want tons of planner printables, tutorials, and worksheets to help you get set up, click the image below or head here to sign up for the Fox Den Resource Library! Hello, Ms. Shelby. I am a high school student with a very hectic and busy schedule. More often than not, I am frustrated due to my lack of personal time for recreational activities. I once enjoyed drawing and writing poetry, and I still do, but I just never had the time to pick up my hobbies again since I have too many requirements at a time. Despite the lack of time, I decided that I wanted to start a bullet journal. I got a dotted notebook and it sat on my shelf for weeks because I was so intimidated and didn’t know how to start. Then, I searched online and found this post (blog?) and read through it. It is extremely helpful. I also looked through your other resources/posts and also found those to be very helpful as well. I would just like to say thank you for sharing your information. :> Currently am starting my journal for 2019 (even though it’s nearly 3 in the morning.. but I am a night owl) and I think that after drawing inspiration from your posts, it’s going to look great. How exciting Sabie! Here’s to a great year and wonderful journey ahead. What an exciting journey you’ve begun Sarah! There is so much more you’re going to discover as you continue journaling. This is such a lovely post, Shelby! I love the idea of a bullet journal and have always been planning to do one but haven’t gotten around it yet. Your article just reinforced this idea to actually set aside a time and do it since I already have the materials needed. I’m gonna see what it can do for my entire productivity since I am planning a whole month of activities to accomplish. thanks for some of the awesome ideas! Give it a try and I bet you will LOVE it, Lanie! I attempted to start a bullet journal. I started with monthlys and little lists here and there. I tried to do the “typical” journal structure and then threw it all out the window. I’ve already got a new journal for next year and I’m getting ideas. The questions I had is about how many pages to skip. If I do a couple pages for that month then how many pages do I skip before another collection? What’s your best advice for that? I’m afraid I’m not understanding your question, Danielle! Are you asking how to make sure you have enough pages for collections and all your plans for a single month? It sounds like you’re trying to set up more than a month in advance, which is forcing you to decide how many pages to keep in a month. Personally, I don’t do more than a month in advance, so I use as many pages as I need before I set up the next month. That means there’s no guesswork involved! But if you want to do that, that’s totally fine. I’d then suggest you either keep your collections in a separate collections journal (see this post for more on that: https://littlecoffeefox.com/2017/09/05/3-reasons-collections-journal/ ). Or if you’d rather keep it all in one journal, keep your collections in the back of your journal and your plans in the front, working your way to the middle until you’re out of pages. That way you can keep them all separate and not have to guess how many pages you’ll need with collections. Also, if you’re waiting until January to start you bullet journal back up, I’d highly suggest you read this post ( https://littlecoffeefox.com/2017/01/23/how-to-start-a-bullet-journal-middle-of-a-month/ ). I hope that helps! This is lovely. I have a question though. the first picture, pages Level 10 Life and Level 10. What is that? Do you talk about that anywhere? That’s what first drew me to this article because I was interested in what that was. I’ve read a few of your posts and we sound like very similar people regarding our perfectionist tendencies, fear-based procrastination and chaotic-creative’s approach to paper-based brain-wrangling systems! Notebooks have never worked for me in the past either, but this whole ‘bullet journal’ system is unlike anything I have encountered before and I’m excited to give it a go. (Also, I get to buy new pens. Always a winner). It seems to have totally transformed the way you organise yourself and measure/enhance/discipline areas of your life and you give me hope it can do the same for me. Your posts are really encouraging, reminding me that it’s ok to screw up sometimes – it’s not the end of the world and ‘done’ is better than perfect! Tash, new pens are ALWAYS a win! Welcome to the world of bullet journaling- I think you will like it here. I started out doing a bullet journal to organize my work schedule and record stuff in a journal. After trying numerous layouts (using suggestions from you and Boho Berry and others), I came to one layout that worked well for me. I then tweaked this layout for another couple of months to get what I wanted. I had been using several types of books as the foundation for my journals. However I was drawing everything by hand. I looked around and found a 14 month planner in 8 1/2 by 11 inch format with a two-pages-per-week spread and a monthly calendar/notes (with 3 mini-monthly calendars – last current-next) spread which was similar to what I had settled on. The left side of the weekly spread has daily divisions, which I split in half and how have an appointments column and a journal column. On the right I created at the top a weekly tracker type of column for memos to write (a big part of my job), a narrow column divided into Priorities, Waiting for/Follow up, Next week, and Horizons. This is about 2/3 of the page. At the bottom, I have a weather table and a weekly tracker divided 30%-70%. Using this pre-printed format takes me half the time to make up a weekly spread. At the front, I use the pre-January pages for an index, and some key collections. At the back, I have used the Notes pages to create an addendum of collections pages, which are indexed on the index pages. This is a minimalist type of guy’s journal set up for my specific needs at work. I include personal evening and weekend activities in the weekly calendar (I work 8-4, M-F). However, I also have a personal bullet journal – I keep them separate by choice. I leave my work bujo at work so others can see the data in the calendar as needed, but I carry the personal bujo everywhere, including to work. Without the bullet journal concepts, I would not have been able to create this unique work-specific bujo tailored to my unique needs. It saves me several hours per week and keeps me on track. And it only took me about 6 months to set it up. Thanks to all the bujo-ers who share their ideas. It sounds like you’ve got quite the tailored system, Bill! That is truly fantastic. Your level of customization is exactly what is so incredible about building your own planner from scratch. There’s nothing like having a system formed perfectly around your own life and needs. Thanks so much for sharing! Don’t worry about your handwriting, Lynn! As long as you can read it, it doesn’t matter if it’s chicken scratch or the fanciest penmanship. Besides, you’ll find that writing so regularly will likely improve your writing over time. I have a question about perfection. I´m a bit confused about the Key / signs. Visual I would like to put a line across the task-sentence, when the task is done. For me the pages looks perfect with this signs, but visual I will not easy see what is done or not. For me it looks like a new list of tasks. Thanks so much, Anne! First of all, I would say don’t let perfection get in the way of a good system. You can see my thoughts about perfection here. And if you want to check out my post about the bullet journal key, you can read it here. I use boxes that I fill in when I complete a task, and it gives me the satisfaction when I color it in as well as giving a clear signal that the task is done. Maybe that’s the solution you’re looking for! My advice would be to experiment a bit over the next few weeks and play with different icons to see what you like and don’t like. I hope that helps! I am a 59 year old still trying to figure out this adult thing! I love, love, love your website and your ideas. I have been so frustrated with how inflexible planners are for years. I am thrilled with this and YOUR site sparked me to do my 1st Bullet Journal. The ‘done not perfect’ is the only reason I haven’t torn out the 1st creation (the Key). It is just a wonderful site and I wanted to say thanks! That means a ton, Dennis, thank you! I’m so glad you have taken this philosophy to heart and jumped into the bullet journal world! This is really helpful. Thanks a lot for the great tips. I’m really looking forward to starting my own bullet journal! This has been the most helpful post I’ve seen around. I’ve been trying to start a bullet journal for a while now, but haven’t had the chance. After seeing that you provided suggestions for supplies, I’ve finally decided to try it out on my own. All I was really looking for is what types of supplies worked for people – and no one really says that much.. so thank you!! I’m super excited about this. I track everything on my phone, but I do love writing and I always want to write my tasks, trackers, goals, etc. in a book so I really hope buju-ing will be fun! I’m so glad it was helpful to you, Cathlyn! Supplies are definitely a very personal choice, but when you find the right ones – boy, you will feel the difference! I tried getting the cheapest stuff I could when I began, but my organization really hit its stride when I switched over to a Leuchtturm1917 journal. It made me excited to use it each day, and that was completely new for me! I hope you have fun beginning your bullet journal journey. I’m sure you’re going to love it! I need someone sweet and helpful like Summer to help me with my BuJo. Hi Shelby! I came to your blog after seeing your post on the Daily Habit Tracker on Pinterest. (I’m so excited about starting it that I can hardly stand it! *Nerd alert*!) Anyway-that post led me to your Morning Pages post, and then I found this post about your Bullet Journal. So I need to know–are you using 3 different journals–one for the Daily Habit Tracker, one for your Morning Pages, and one for your Bullet Journal, or do you use the same journal for all three? I apologize if you’ve already covered this elsewhere. I’m just excited to get started because, I, too, have random little bits of notes and thoughts spread all over my world, and it’s driving me crazy!!! I need a system, and I like the sound of yours! Thank you in advance! I’m so glad you enjoyed the posts! I currently keep my Morning Pages in a completely separate journal. BUT I do keep my habit tracker in my bullet journal. In every monthly spread in my bullet journal, I add a fresh habit tracker to fill up. I find that having several logs like that in my monthly spreads helps me tremendously. I hope that helps, and I couldn’t be more excited for you to find bullet journaling! I don’t know how I got anything done before my bullet journal. I wish you the best of luck in getting started, and please don’t hesitate to contact me if you have any more questions as you begin. You’ll love it, I just know it! Great post, helps a lot with getting to a point to start. I do have a question, I think related to this post, how you combine monthly and daily lists with other lists like your examples Holiday presents etc. Do you just flip until the next free spread or do you keep all month and day lists together without other stuff in between? Hi, I loved this article. I am looking to buy a bullet journal and it has been harder than I thought to find one. Do you have any ideas of where I could find one? I’m glad you enjoyed it! Finding the right materials can be tough. You can check out my supplies page here to see all the materials I use and where I got them. I hope you can find a bullet journal that’s perfect for you! Maybe I’m just tired right now. It is late. But it seems hard right now. My mind is foggy and guess I need to come back to this again. I have all those bits off paper you talked about. not sure how to start. I have so many things going right now that I want to do. 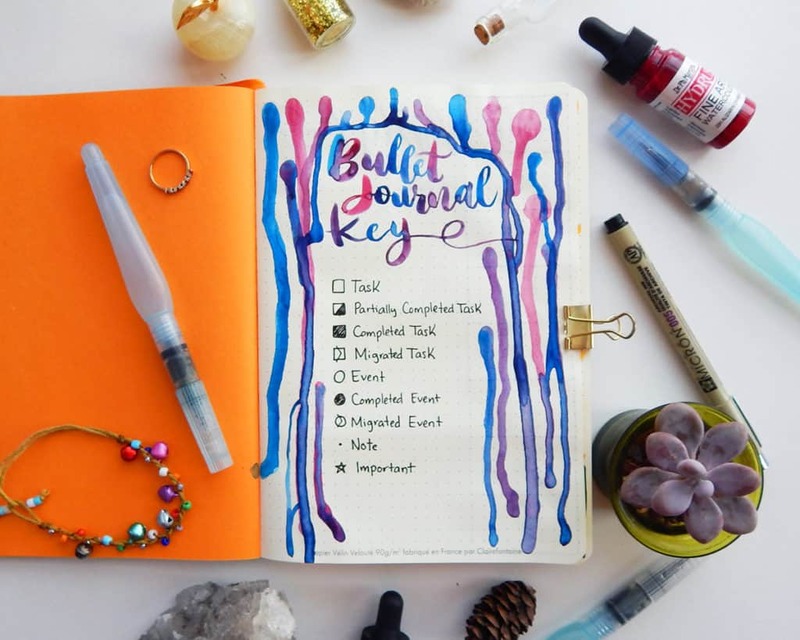 Starting a bullet journal can be a big undertaking, so definitely take your time! In my experience, rushing into it is the best way to become overwhelmed. Take it slow and I’m sure you’ll find the best way to balance all the things in your life! Feel free to message me if you ever have any questions, I’d be more than happy to help! They are so darn easy to collect, aren’t they? I’m glad you thought the post was helpful and wish you the best of luck with using those notebooks to their fullest extent!